The North Circular Road links the eastern, northern and western suburbs, and enables through traffic to avoid the congested areas of Central London. AT ITS EASTERN END the North Circular Road crosses the marshes of the Lea valley, between Hale End and Edmonton, by a viaduct of reinforced concrete. The two pylons shown at the top of this page mark the entrance to this viaduct and the illustration in the middle shows the concrete pillars and transverse members which support it. From the western end of the viaduct the road continues through Edmonton, Palmer’s Green, New Southgate, Finchley and Hendon; then it runs southwards through Neasden and Stonebridge Park. NEAR STONEBRIDGE PARK, Middlesex, the road is crossed by an aqueduct carrying the Grand Junction Canal. The bridge over which this passes is of reinforced concrete, and it maintains the canal 25 feet above the road level. Raised footpaths are provided for pedestrians at this point. The aqueduct is about a mile north of of the point where the North Circular Road crosses Western Avenue, one of London’s newer arteries. South of Western Avenue the road continues down Hanger Hill to Ealing Common, and thence, via Gunnersbury Lane, to its junction with the Great West Road at Chiswick. ON THE LEA BRIDGE VIADUCT, near the eastern end of the road, in the background are the two pylons also shown in the upper photograph on the preceding page. The overhead wires of the electric grid cross the road at this point. 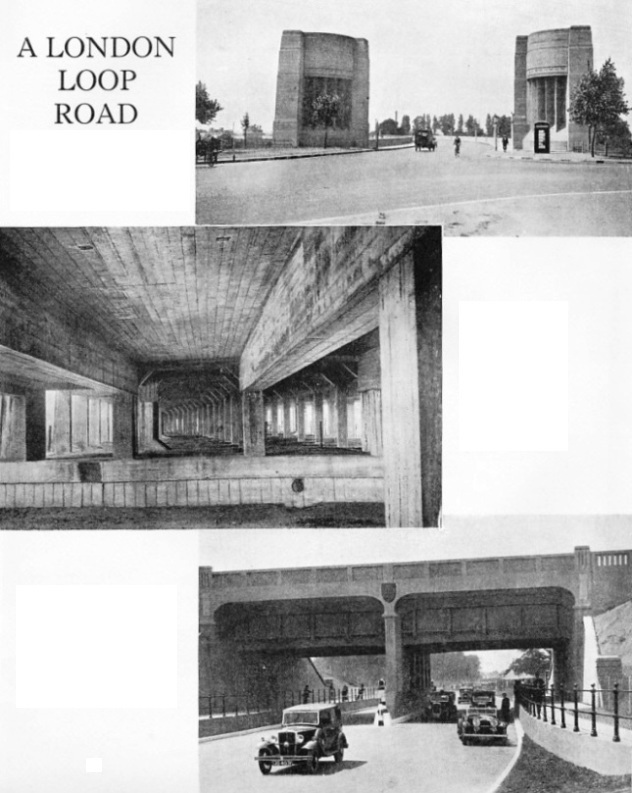 Beginning at the junction of Eastern Avenue with the Southend Road, near Walthamstow, the North Circular Road has a length of about 15 miles and ends at its junction with the Great West Road near Kew Bridge. Nearly half the length of the road is divided into double carriageways by a central island. AN EXCAVATOR AT WORK during the building of the road near Stonebridge, between Ealing and Wembley. 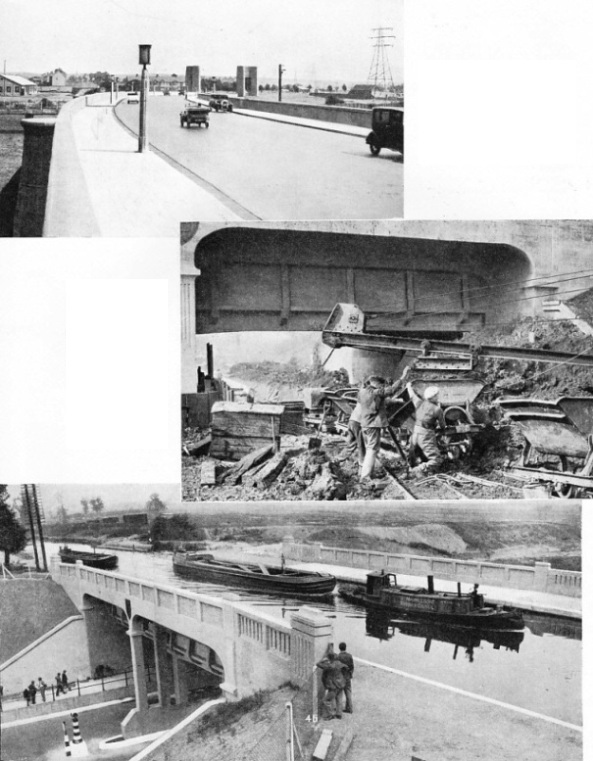 The bridge shown in these two photographs carries the Grand Junction Canal and two footways for pedestrians. As the canal runs for 12 miles without locks in this neighbourhood, 3-feet penstocks have been provided for use in emergencies, and the water from the canal can be diverted into the River Brent, should the necessity arise. The unusual design of this bridge made it necessary for the foundations of the road to be lowered so that adequate clearance for traffic was provided.